Nokia has recently unveiled its wide product range at Mobile World Congress 2018. It had several products showcased including Nokia 8 (Sirocco), Nokia 7 Plus, Nokia 6 and Nokia’s portable banana phone as well. However, it seems that the smartphone maker hadn’t finished yet as the latest leaked Nokia 9 image render up on the web revealing about its triple camera setup and other. According to the Slashleaks, Nokia will boast a 6.1-inch QHD AMOLED display with 18:9 of aspect ratio. Under the hood, the device will have Snapdragon’s latest 845 SoC and 8GB of RAM with 256GB of internal storage. As per the renders, Nokia 9 will come featuring a triple-camera setup on the back side, which will comprise a primary 41MP wide angle sensor accompanied by a secondary 20MP telephoto lens and a standalone 9.7MP monochrome camera. On the front side, the Nokia 9 will boast a 21MP snapper from Zeiss Optics with display flash. The device could also offer Bothie mode that lets users capture an image at the same time using the front and back cameras. Nokia 9 is said to be equipped with a Quick Charge 4-compatible 3,900mAh battery with the fast wireless charging support. 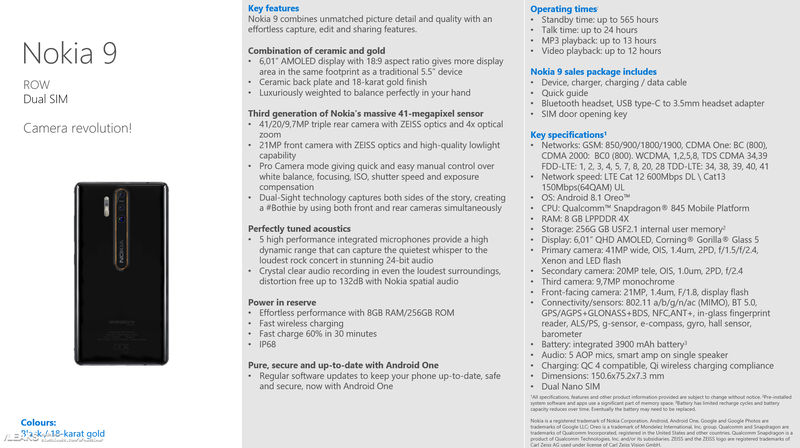 The specs sheet also reveals an IP68 rating for Nokia 9, which means that it will be water resistant. The device is said to come with an in-glass fingerprint reader because the actual fingerprint reader cannot be seen in the leaked renders. The Nokia 9 will come running on Android 8.1.0 Oreo right out-of-the-box. Since these are early leaks before the actual release of Nokia 9, it is advised to take this with a pinch of salt. Meanwhile, share your wish list for the upcoming Nokia 9 with us by writing in the comment section below. Stay tuned for more updates!